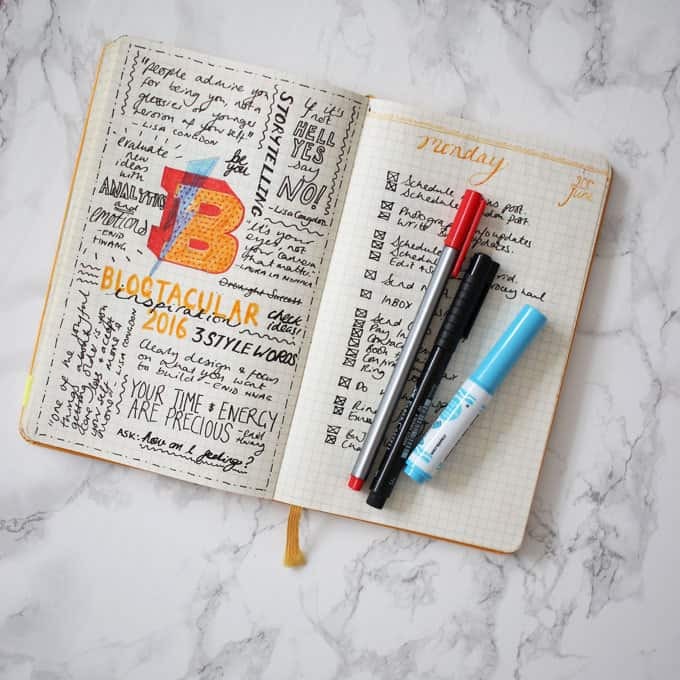 A Bullet Journal review, peek inside my Bullet Journal for the last few months, my daily spreads, weekly spreads, my journaling and to do lists. If you follow me on Instagram, you may have noticed a little yellow notebook appearing in some of my photos. This, my friends, is my beloved Bullet Journal. 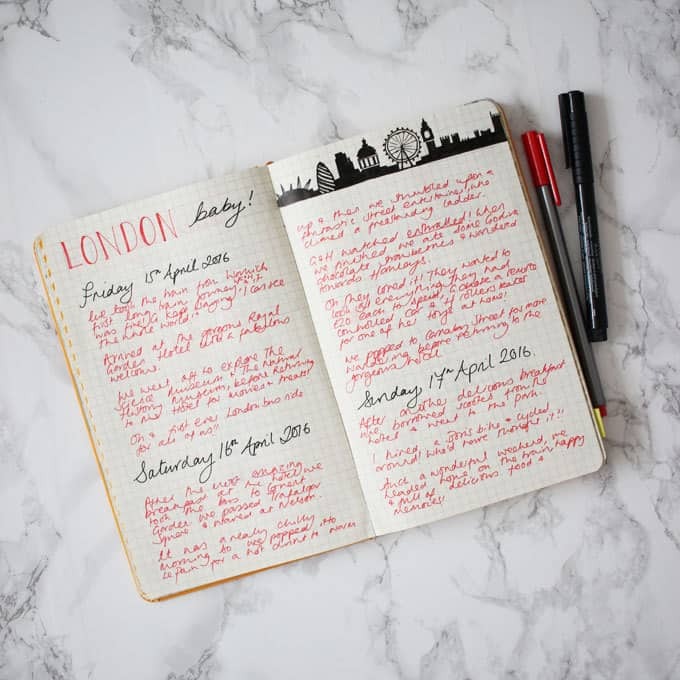 You might remember that I wrote a post earlier in the year about how my Bullet Journal had changed my life in just 6 weeks. 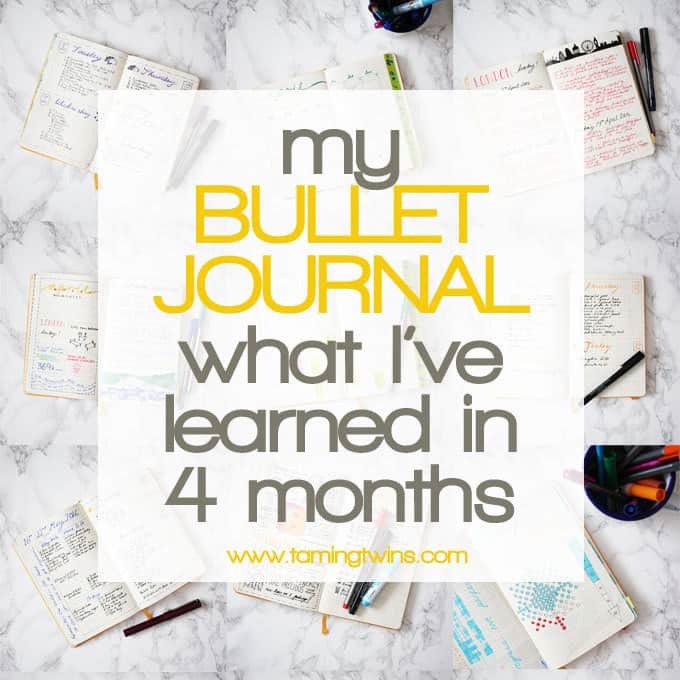 It’s now been four months since I started so I thought perhaps it was time for a little Bullet Journal review. In just those short months, I’ve learned heaps about what works for me and what doesn’t in my BuJo. 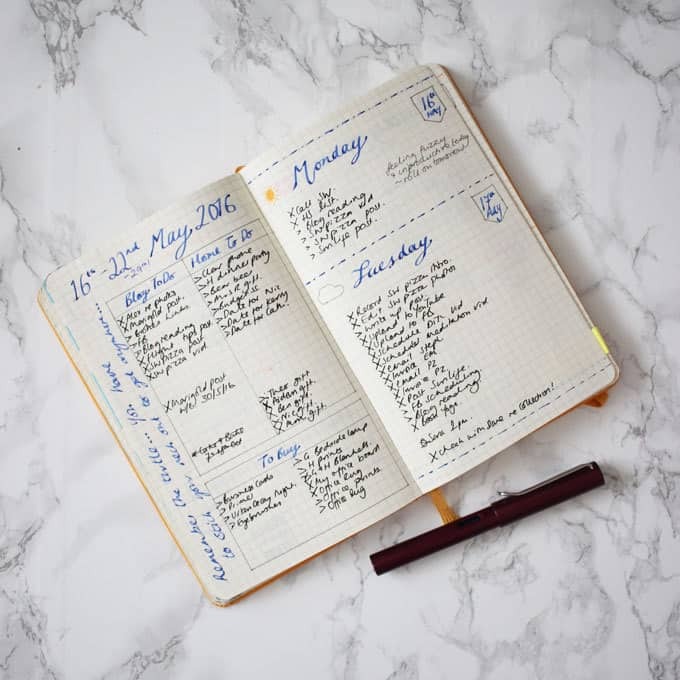 For me, the absolute core of my Bullet Journal is my daily pages, whatever else happens, they are the key to keeping me on the right track each day. Before I go to bed, I tend to review the day and then plan for the coming day. Even if it’s only five minutes, that time for my Bullet Journal review gets my mind straight to wake with a clear head. I’ve played around a little bit with changing titles and adding the weather, but really, these are one thing that’s been pretty static since I started. I don’t see me changing them anytime soon, as they are everything I want right now. I also use a weekly spread on and off. I started out with a weekly spread splitting reminders for the week and also appointments, but this didn’t quite fit. Things I do love in a weekly spread are; a motivational quote (oh YES! ), a split to do list for home and work and a list of things to remember to buy. That’s it! 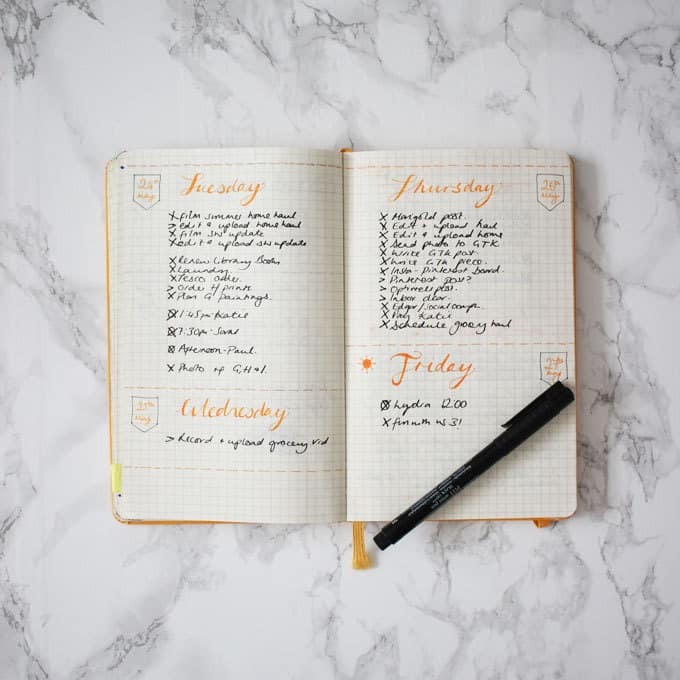 I don’t religiously keep a weekly list and sometimes I extend them to 2 weeks (if I’ve not achieved anything at the end of the first week – oops). They definitely help me to keep focused for the week, when I don’t keep one, I regret it by Friday, I should probably remember that! Another spread that I haven’t continued using was a monthly editorial plan for the blog and for my YouTube channel. Somehow, that’s just not how my brain sees my blog posts, it’s more a to do list when I have posts to write for clients etc. So now, I use a list and I use the WordPress plugin calendar to give me an overview within my blog. It was a pretty idea, but not for me right now. One problem I really had when I started with the Bullet Journal was the future log. When it comes to days and appointments I do need to see clearly weeks ahead and possibly with lots in one day. For this, I really felt that I needed a traditional calendar layout. So, I ended up drawing, for each month, a calendar. When I started this in April, I popped it within my normal pages I was using. But quickly I realised that I needed a few months in advance, so for other months, I’ve put these calendar spreads into the back of the Bullet Journal. My husband finds it hilarious that I’ve gone back to paper, and not just any paper, but one I’ve drawn myself. You know what though, it works for me and I love it, so it’s all good! I’ve been trying to stick to eating better, I’m great at eating healthy meals mostly, but everything goes to pot with snacks. I then think, “I’ve messed up, I’ll go craaaaazy”. So I devised this spread to try and help me to see, it’s about what you do most often that counts. I mark off healthy meals in one colour, and ‘let loose’ meals in another. It’s really helped to give me perspective and I’ll be keeping up with this I think. I’ve also been tracking my exercise and steps and that’s helped too. I lost 3lb after months of dilly dallying around and losing nothing, so hurrah! 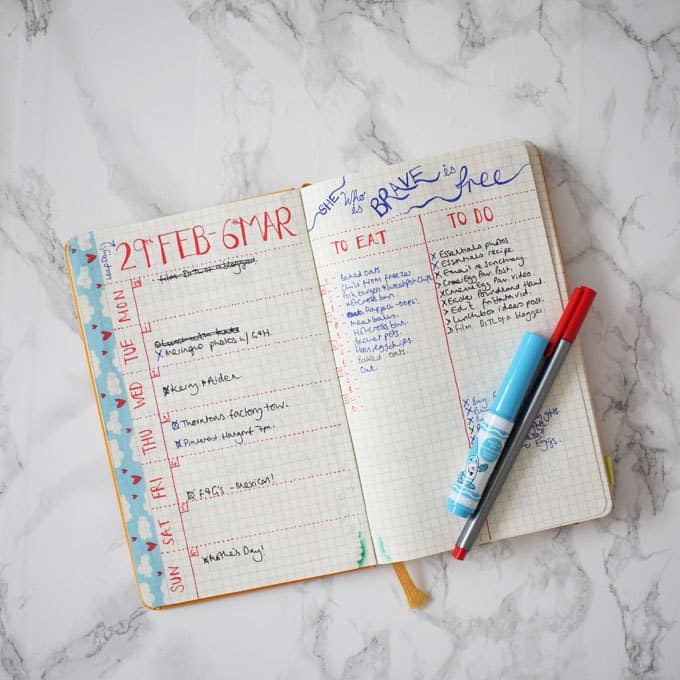 One of the things I’ve enjoyed most in my Bullet Journal, is actually, journaling. When we’ve been away and I don’t need a to do list (‘to do: rest’) I’ve replaced those days with some notes on our trips, or drawings of memories. 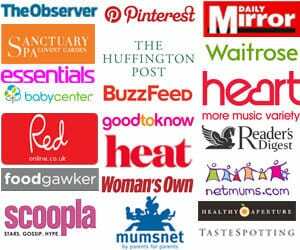 It’s a little bit of creativity, that I’d never ever have got around to normally, but because my book is right there I do it. I find it so peaceful to find a few moments for memories and gratitude about a trip. I hope these will be fantastic to look back in years to come. Oh and my scrawl is not the best, but progress not perfection right?! 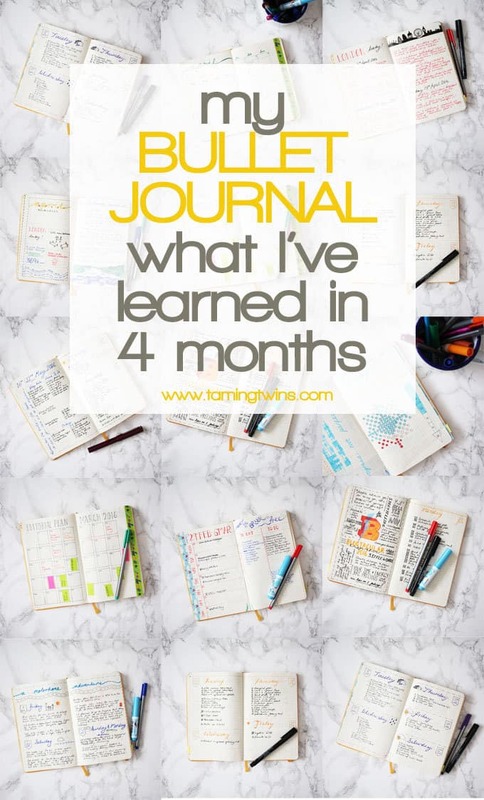 So, here’s what I’ve learned in 4 months Bullet Journal review.. I love having the snippet of creativity in my day. It’s good for the soul, to focus on progress, instead of perfection. Even small improvements are worth making an effort for. I really need to buy and try some brush pens. I’m a bit terrified of losing my beloved BuJo, what’s the answer to that I wonder?! I still want some kind of master, ongoing to do list, but I’m not sure how yet. I like marking out timings to keep me on track. The thought of a new notebook in a couple of months is giving me more excitement than paper should. I really like the colour orange, more than I realised..
You can never have enough washi tape. 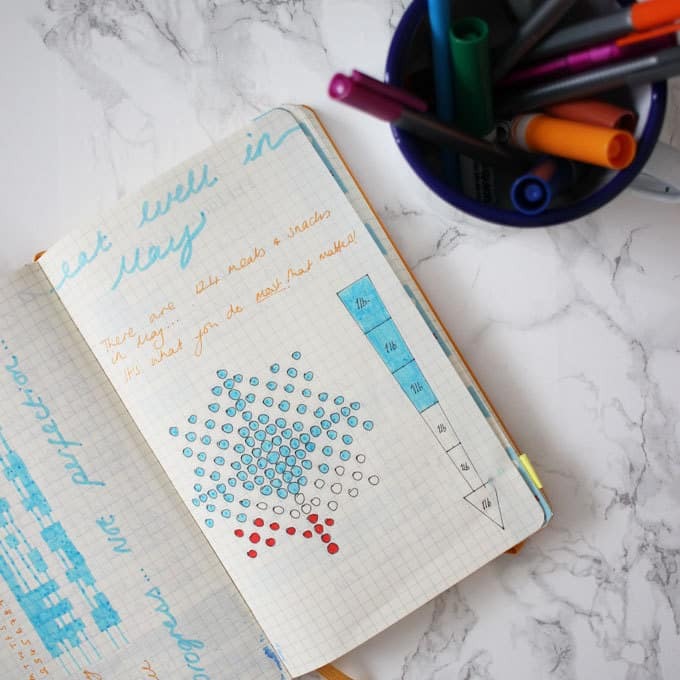 Bullet Journals really bring people together, people are so passionate about them. English weather is crazy, too crazy for me to try and track! 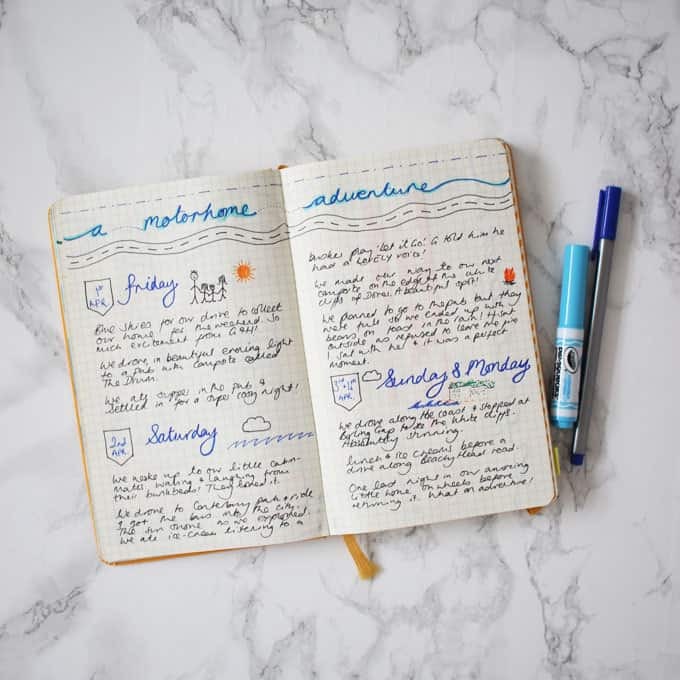 Have you discovered the BuJo yet?! 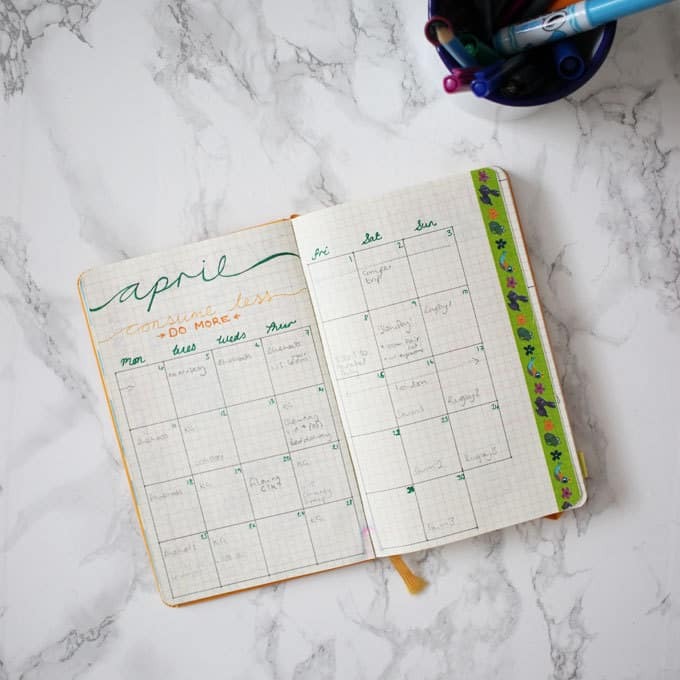 What’s your planner of choice? Pin my Bullet Journal Review for later.. I love this! I’ve never heard of it but looks like a great way to be creative and keep things simple! ???? Great post Sarah. I started using a Bullet Journal in February and I’m still experimenting with the layouts that work for me, and once I’ve worked that out I’ll be writing a blog post (or two). I’m currently using a lined notebook as I already had it so I have to measure and draw lines, so I’m looking forward to the dot grid book I have waiting for my next one. Oh my gosh this is the most amazing thing ever! Why have I never heard of this before??!!!! I seriously need something like this to keep my days on the straight and narrow. It’s so hard to juggle kids, the house and being self employed and “normal” diaries just aren’t enough. Answer to losing your BuJo: Pray FERVENTLY that you don’t, and back up. take photos of every page when its done and save them on a cloud (i.e. dropbox or something) so that if the worst should happen… you can recreate what’s necessary. Oh, and I do track the crazy English weather! I look at the BBC weather page every morning for where I live, note sunrise, sunset, the day’s predicted max/min and the day’s overall weather conditions (i.e. sunny, cloudy etc.) and use the BBC’s main icon for that. that helps to cut through a lof the variations that you get on the average day in Britain (the old joke, if you don’t like the weather here, just wait five minutes….!). I track the weather too, I usually write down the high temp for my location and the weather according to me, ie has it been a sunny or cloudy day. I’ve just started tracking sunrise and sunset and moon phase just for fun and the low temps too. If we have a really crazy weather day I tend to write about it anyway – for example the day we had sun, rain, thunder and hail in the space of an afternoon. I’ve been bullet journalling for 10 months now and it fits me perfectly! Wowie, that is crazy weather Kate, where are you from? I like your colour-coded meal/snack tracker. I’ve been trying to cut down on what I think of as ‘lazy junk food’ lately – you know, when you buy crisps at work because you didn’t get around to packing snacks or you get a takeaway because your fridge is empty – but I’ve been having trouble tracking it. I’ve been trying to track it as a basic ‘no junk food today’ in my habit tracker, but that means that I don’t distinguish between ‘takeaway because I forgot to go shopping’ and ‘going down the pub for dinner with my husband’, and, while going down the pub for dinner with my husband every night isn’t a good idea, I *do* think it’s emotionally healthy to sometimes go to the pub and eat a burger and fries for dinner with a pint of beer on the side (as long as that really is sometimes! ), but it’s not healthy in any way to eat junk food due to lack of organisation/pre-planning. I also don’t like doing it on a daily basis, because it encourages the ‘what the hell’ effect, where I buy some lentil chips at the office and then think I might as well get a takeaway for dinner because I’ve already ‘messed up’. A spread similar to this one looks ideal for my purposes: green for healthy meals/snacks, yellow for when I consciously treat myself, and red for for that ‘lazy’ junk. Thanks for sharing! I’m getting a little bit obsessed with seeing how other people use their bullet journals, yours is so pretty. I love a list and my productivity recently has been terrible so hoping this will help me get back on track. I am new to bujo too and I love your summary point about about “It’s good for the soul, to focus on progress, instead of perfection.” That’s why I have decided to give bullet journalling a go. 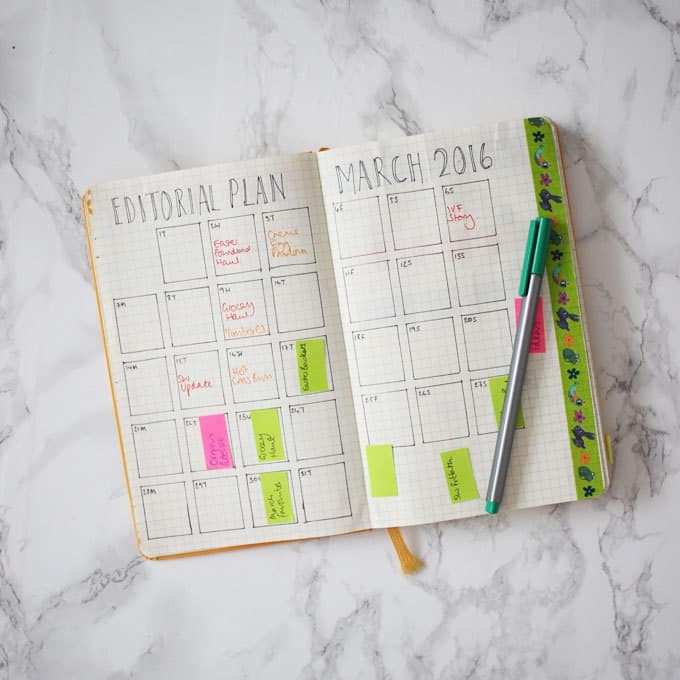 My only problem is the perfectionist in me is planning the planner and paralysing me from starting! Lol but I do have loads of great product ideas for this to go on our site http://www.properpost.co.uk. I love Bullet Journalling! I was never an organised person, but in the few weeks I’ve been using my BuJo I feel like I’ve become so much more productive! I love the idea of the meal tracker. I have a habit of eating whenever and whatever I like, but tracking my meals and food intake will probably make a massive difference! A hint in case of a lost BuJo: Put your contact details on the very inside cover. I lost mine at Uni the other day, and had it returned to me within a few hours. I must give this ago ! I’ve been dragging my Filofax around for years and feel very inspired to try something new ! Would be good for me to jot down recipes and plan better 🙂 love the post ! Thanks so much for sharing your great, ideas Sarah. I share your love of bullet journaling AND your fear of losing it, so, I decided mine was just never going to leave the house. Ever. I put appointments both in my bujo and on my phone- my phone is the portable calendar. For things like shopping lists that I want to take with me later, I tape a sheet of pretty memo paper into my bujo using washi tape and write the lists on the memo paper, not in the bujo. The lists do have their own dedicated pages in my bujo, but those pages are just reusable “frames” for the taped in lists. (Sometimes, I take pictures of my lists too). In my purse is a “mini bujo” – a small memo book where I jot down info that needs to end up in the real thing. 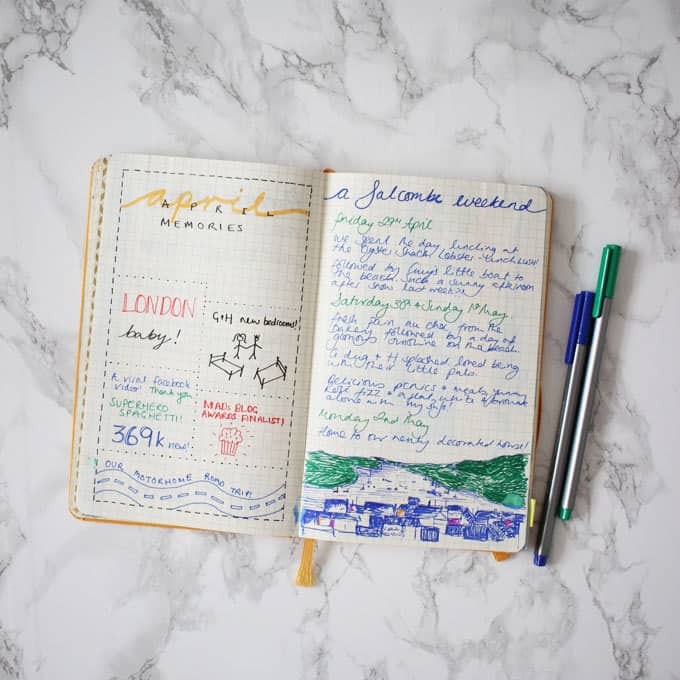 So far I have managed to hang onto my journal almost a year – a miracle for someone like me! You also mentioned the challenge of where to put a running to do list. My running to do list actually starts at the back of my journal and works toward the center. Once about 90% of the tasks on a page are done, I transfer the left overs to the next page in and put a big X across the page of completed tasks. Its very satisfying to see so many Xd out pages in the back of my bujo. ???? 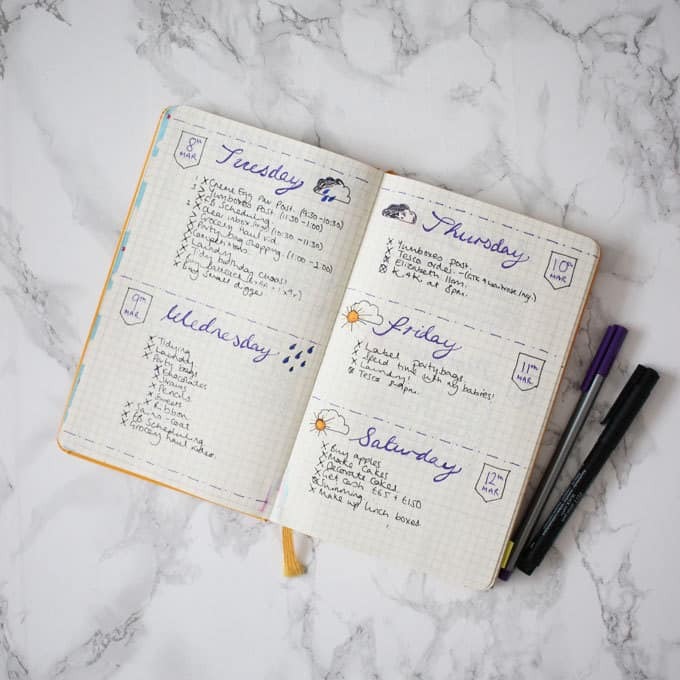 Eventually, the items in the front of my bujo and my to-do lists that started in the back will meet in the middle and it will be time to pick out a new bujo, which will be both fun and kind of sad, because my bullet journal feels like an old friend now!